Koi can grow up to 3 feet in length and can live for more than three decades -- and they prefer to live with other koi. 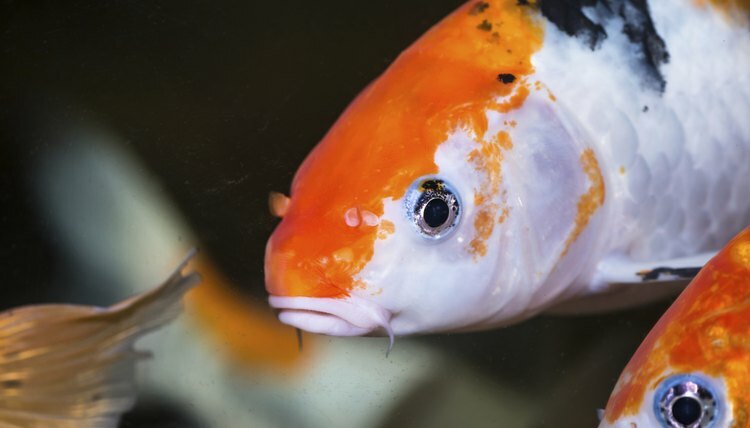 But unless you have an aquarium so large that it can hold the gallon equivalent of a small pond, a tank isn't a long-term housing solution for koi. In the short term, you can use an aquarium as a temporary holding tank for an adult koi, and you can house koi in aquariums as babies less than 6 inches long. Overcrowded conditions can be harmful to koi because of the potential for toxic ammonia buildup in the water. An aquarium needs to be big enough to handle the fish load. FishChannel.com recommends one 12-inch koi per 100 gallons of water, or nine koi 6 inches long, or ninety 2-inch koi. Keep an eye on the growth of the koi, and properly adjust the population to suit aquarium capacity. Put the aquarium where the fish can get some peace and quiet, and give them a few inches of rocks and gravel to dig through. A heater is not necessary for these cold-water fish, but purchase the best filter you can. A good pump will keep the water aerated and properly oxygenated. Make sure the top of your aquarium or indoor holding tank has a screen top or netting cover, as koi like to jump out of the water. Think of how often you have to change the water in a goldfish habitat and extrapolate that for the larger pond-dwellers. High-quality granulated carbon added to a strong supplemental filter system, along with an under-gravel filter, can keep the water cleaner. The filtration system should be processing about 350 gallons per hour for each 12-inch fish. Koi eat a lot and in turn produce a lot of waste; be careful not to overfeed and exacerbate water pollution. Vacuum the gravel at least once a week. Regularly check water levels to ensure nothing that can harm your koi is off, from oxygen to ammonia, and watch for potentially fatal rapid changes in pH and other values. Koi owners in frigid states face the challenge of keeping their fish in ponds that don't have appropriate hibernation depth and freeze solid in winter. In addition, the winter chill can kill aquatic plants. One alternative to a massive glass aquarium setup for winter koi and plant housing is a 300-gallon commercial-grade plastic storage tub, which you can find at hardware stores and will require about 36 square feet of floor space. Building an indoor pond with similar or greater capacity is a reasonable do-it-yourself project, and you can design one to complement your home's decor. Having an alternative space for your koi comes in handy when you need to isolate a fish for medication.